The birds have paddling pools in their runs, big robust things made from recycled tyres. I tried the kiddie paddling pools, and even dog bath kind, and they are fine for ducks, but the geese rip them to shreds in a matter of days. So now they have these hulking great heavy things, and nothing short of a were-goose could rip through them. Nothing beats a proper natural pond however, with mud and grass and bugs at the bottom (and, I suspect, my bulbs). 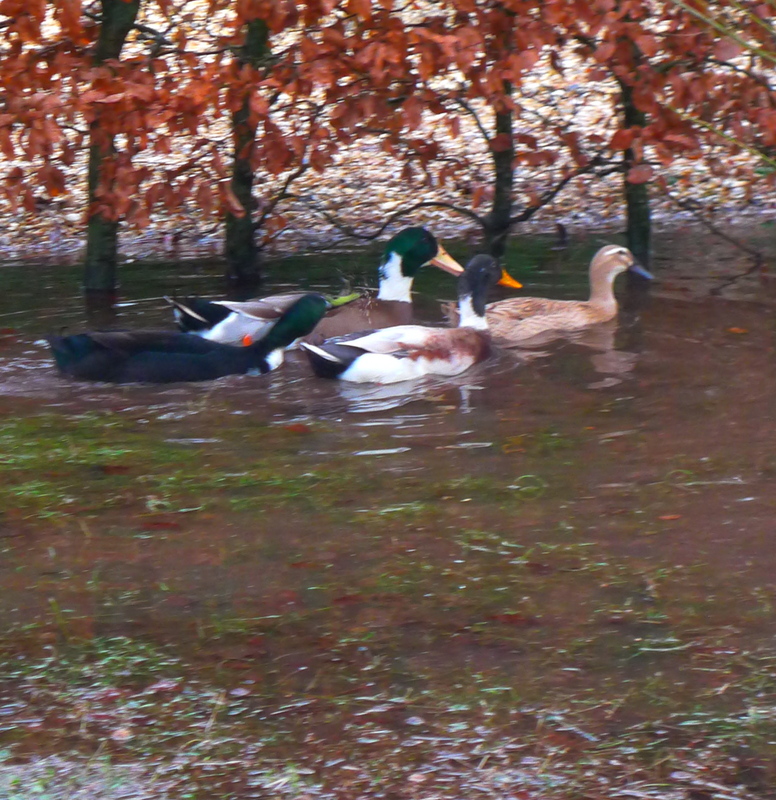 To my surprise it is deep enough for the ducks to swim in, they must be very shallow draught ducks. The geese have to settle for paddling, but are very happily preening and splashing, plunging their heads in to the water and flicking it over their backs and wings like some sort of excitable avian elephant. In fact when the sun comes out (briefly), the monster puddle takes on the air of some sort of mini African water-hole. 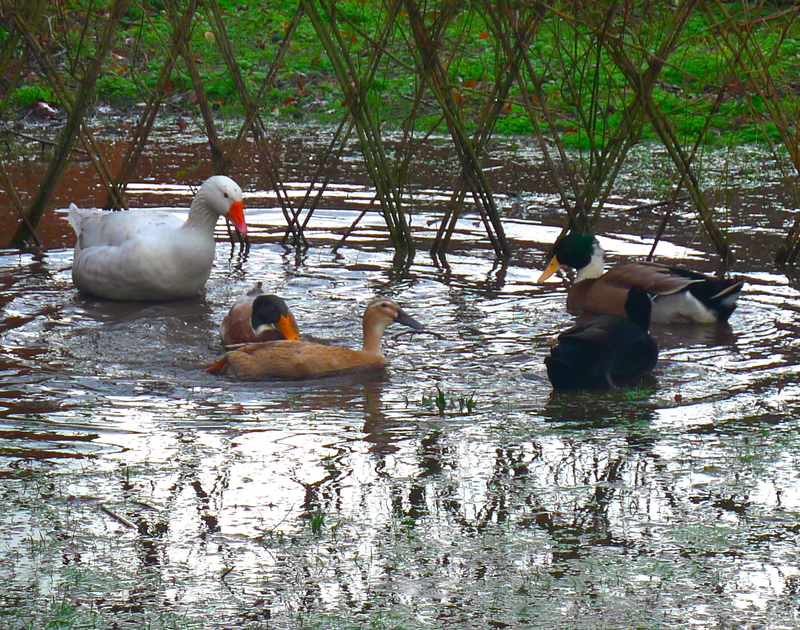 The ducks paddle around merrily, whilst the geese lord it over all comers. Blackbirds, pigeons, wagtails and robins come to bathe, drink, and generally have a bit of a play. The odd pheasant will wander over occasionally, although they don’t seem to like getting wet. The two house cats, Groucho and Morag, will slink down for a drink, but only when the geese aren’t looking, as they are rather intimidated by any bird that is that big, and that self-assured. Of course officially Groucho, a true alpha-male if ever there was one, is not intimidated by anything. He just happens not to choose to go to the pond when the geese are looking his way, that’s all. It’s coincidence really. Morag however, is a complete nut of a cat who is terrified of everything, particularly Christmas trees, and her own shadow. The sole exceptions to that are us, her brother, and bizarrely, the neighbour’s now-departed Alsatian who used to break into the garden from time to time. She loved him, and used to trot around the garden alongside him in a “Have you seen my new best friend? Isn’t he cute?” type way.